Omega TK offers the same features as the OMEGA application for conformer generation. Please refer to the OMEGA product page for details. Example of a result obtained from a combination of modeling toolkits: conformers from Omega TK were overlain using Shape TK while surfaces and coloring were generated by Spicoli TK. Conformer Generation with OMEGA: Algorithm and Validation Using High Quality Structures from the Protein Databank and Cambridge Structural Database, P.C.D. Hawkins, A.G. Skillman, G.L. Warren, B.A. Ellingson and M.T. Stahl, J. Chem. Inf. Model., 2010, 50, 572. Conformer generation with OMEGA: Learning from the dataset and analysis of failures, Hawkins, P.C.D., Nicholls, A.N., J. Chem. Inf. Model., 2012, 52, 2919. 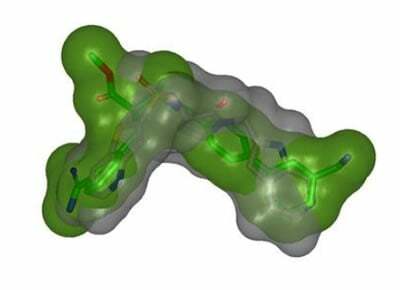 Conformational Analysis of Drug-Like Molecules Bound to Proteins: An Extensive Study of Ligand Reorganization upon Binding, E. Perola and P.S. Charifson. J. Med. Chem. 2004,47, 2499-2510. Comparison of Conformational Analysis Techniques to Generate Pharmacophore Hypotheses Using Catalyst, R. Kristam, V.J. Gillet, R.A. Lewis and D. Thorner. J. Chem. Inf. Model.2005, 45, 461-476.